The Grange Farmhouse is a magnificent Grade II listed Georgian farmhouse built around 1840, set in 3.5 acres of grounds, including a beautiful enclosed Walled Garden. The Farmhouse also has its own iconic beach hut at nearby Wells-next-the-Sea. The Farmhouse comprises circa 7,000 sq ft of internal space and sleeps up to 18 people, with its 9 bedrooms and 7 bathrooms. The hub of the downstairs living space is a huge open plan kitchen with large central island unit, which opens out into the Walled Garden. The kitchen has seating for 18 people at the kitchen table with further seating at the island unit. The farmhouse has five further downstairs reception rooms, including a formal dining room with seating for 18 people. The Farmhouse is located 2 miles west of the historic Norfolk market town of Fakenham, once voted 7th best place to live by Country Life magazine, and is just 10 miles inland from the North Norfolk coast and its glorious sandy beaches at Brancaster, Holkham and Wells-next-the-Sea. The stunning Georgian village of Burnham Market, with its village green surrounded by 18th Century houses, shops, designer boutiques and The Hoste Arms, is just 9 miles away. 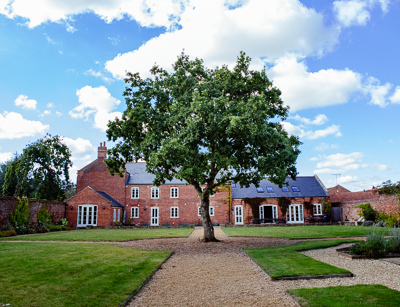 The Farmhouse is perfect for family get togethers, celebratory occasions – including milestone birthday parties – or just groups of friends looking to chill out together in beautiful North Norfolk.